Mike and Connie Sams brought the stand up paddle boarding lifestyle to Rome, GA in the Summer of 2014 when they opened River Dog Paddle Co - providing SUP enthusiasts and novices alike with gear, boards and good times. In December of 2015 Mike and Connie expanded this lifestyle with River Dog Outpost - bringing beer, boards and good vibes to Downtown Rome with an eclectic riverfront bar and beer garden. Leaving Atlanta in search of wide open spaces, Mike and Connie moved to Rome in the Spring of 2012. Headed home on a Summer evening after an awesome day of music at Rome River Jam 2013, they stopped for a stray dog in distress along the Coosa River. They rescued him and named him River Dog. Combining their passion for dogs, the outdoors and stand up paddle boarding with a dedication to enhancing their community and the viability of local rivers as advocates of the CRBI - Coosa River Basin Initiative and local animal rescues PAWS, Claws for Paws, and Friends to the Forlorn (who is ultimately responsible for River Dog having his very own SUP shop and bar) Mike and Connie carved out a corner of good vibes on Broad Street. Located on Historic Downtown Rome's Broad Street, one of “America’s Greatest Main Streets”, River Dog Paddle Co and River Dog Outpost are just steps away from where the Etowah River from the East and Oostanaula River from the North converge to form the Coosa River which flows West into Weiss Lake in Alabama. Running along the Rivers are miles of trails and picturesque walking bridges that offer stunning birds-eye views of the rivers below. 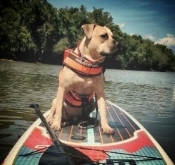 Independently owned and operated, River Dog Paddle Co offers SUP sales, rentals, demos, lessons, yoga and fitness classes, while providing opportunities to explore magnificent rivers and waterways in the Floyd County area and beyond. River Dog Outpost is Rome's only establishment where you can relax along the river while enjoying a crafty beer on tap or in a can, or a cider or glass of wine along with Food Truck deliciousness most nights, and super fun festivities, events and live music throughout the year. With warm, sunshine vibes every day of the year, the chill atmosphere at River Dog is one of kind.